I burst into tears when I was diagnosed with cervical cancer. I didn't know what to do. I began intensive treatment and when a nurse talked about the hospice, I didn't know what they did at first. I didn't think it was for me. I went to look round and I was frightened but some of the other patients talked me round. The first time I went for the day I got up and left but a couple of the other patients came after me and if it wasn't for them I wouldn't have come back. They told me how they'd felt the same when they first went to the hospice, but now they love it - and so do I.
I have 7 children and at home I can't talk about cancer, but at the hospice we even have a laugh about cancer. It might sound strange but because we're all living with it or other illnesses we understand how each other feels. I felt isolated before I knew about the hospice and still have those feelings, but going there gives me something to look forward to because I'll be around people who understand how I feel. I've had massages at the hospice which have helped so much that I didn't need any pain relief the next day. I've been able to explore my feelings through art therapy and have created pictures and a remembrance tree that I built for everyone to put leaves on that will have the names of people we miss on them. I've met friends along the way during treatment who were younger than me and they have died. It scares me but I try and keep things in perspective and concentrate on myself. Stress makes my symptoms worse so I try to stay calm. 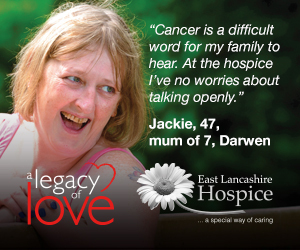 See Jackie starring in the hospice's Legacy of Love campaign.